Many Canadian kids dream of playing hockey for their favourite team. Jordan Murray got a taste of that last summer when he was invited to the Toronto Maple Leafs development camp. As a bonus, the University of New Brunswick veteran defenceman suited up alongside a young American named Auston Matthews, who had just been the No. 1 pick overall in the NHL entry draft. "We played two exhibition games in Toronto last summer and I actually sat next to Matthews in the dressing room," said Murray, the Varsity Reds' fourth-year defenceman. "There was a lot of guys just watching what he did and going crazy with the stuff he could do with the puck and his vison, how big and strong he was." The native of Riverview, N.B., was not done however, as he was invited to the Tampa Bay Lightning's main training camp in the fall of 2016. "To go on the ice with guys that actually play in the NHL was quite an eye-opener," Murray said. "You know how hard you have to work, how good those guys are, and how smart they are." Murray added that being at an NHL camp taught him a lot about the pro game and how the players carry themselves. "Every little thing you do is under the microscope there; they're truly professional all the time," he said. "(I've learned) just how hard they work. In the gym, on the ice, everything is full out, 100 per cent all the time. This year I came back and tried to do that a little more than what I have in other seasons." The extra motivation gained from skating with NHL players has certainly paid off, as Murray put up the best numbers of his UNB career this season. In 30 games, the 24-year-old graduate of the Quebec Major Junior Hockey League led all defencemen with 40 points (14 goals, 26 assists). "Jordan's had a fantastic season, our team has had a lot of success, and he's been a big part of that," UNB men's hockey head coach Gardiner MacDougall said. Followers of AUS hockey saw this season coming for Murray. The Bachelor of Recreation and Sport Studies student was named the conference's rookie of the year in 2014 and to the U SPORTS All-Rookie team. He has also been a U SPORTS First Team All-Star the last two seasons. Murray was named U SPORTS Defenceman of the Year in 2016, while helping the Varsity Reds win a national title, and is up for the honour again on Wednesday night. MacDougall said that Murray is unlike most players who eventually hit a plateau. Murray, however, has been able to grow and improve each and every year with his overflowing trophy cabinet being the evidence of that. "He's gotten better each and every year," MacDougall said. "It's not always easy. You look at a lot of players at the U SPORTS level who will have a breakout first or second year, but level off. He's continued to find new marks for his performance." 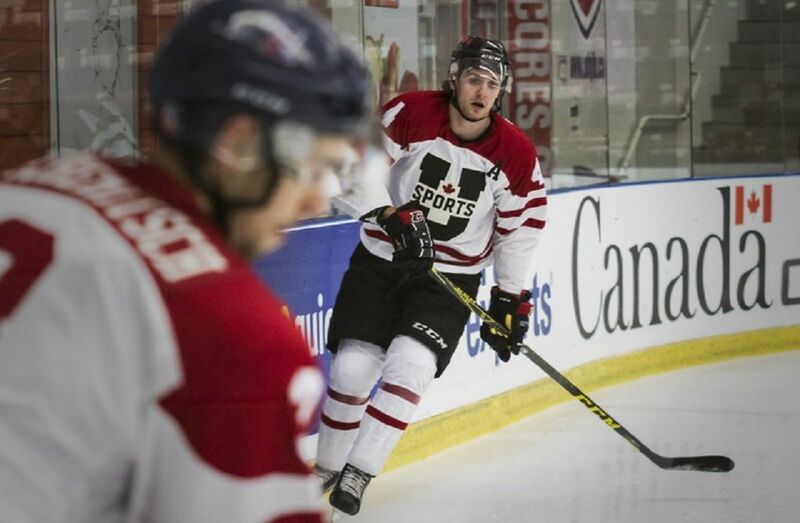 The thought of playing professionally hockey has not gotten to Murray, as he is still focused wholly on winning with the Varsity Reds. "(Pro hockey) is definitely something I've thought about," he said. "I can't look too far ahead, I need to have all my focus and energy right on the nationals and hopefully get another title this year." 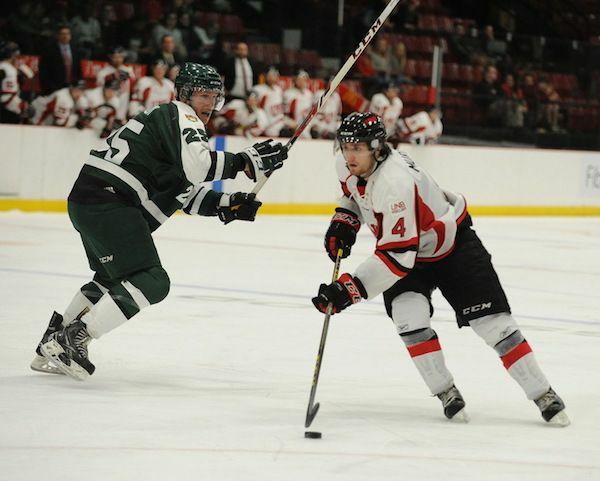 UNB is hosting the 2017 U SPORTS Cavendish Farms University Cup tournament this week, giving the Varsity Reds a chance to defend their title on home ice. Murray is confident about his team's chances, and isn't worried about the pressures of hosting. "I think we're a veteran group, we know what it takes, we were there last year," he said. "We know what it takes to get there and how perfect you have to play because every little mistake can matter. I think we're ready for it."